I reviewed a few VPN apps for iOS earlier this year, and while I stand by my previous verdict, there’s a new kid on the block that deserves some attention. Long time patrons of vpncompare.co.uk might remember an old article about the “Shellfire Box,” which set out to revolutionize the way we use VPNs. The German company had a very successful Indiegogo campaign, and since then has been pushing the envelope in terms of both quality hardware and software. In their latest project, Shellfire is bringing their VPN offering to your Apple device. As of December 2nd, the Shellfire VPN iOS app is available for download on the App Store. I picked it up a little over a week ago and have been testing it since. 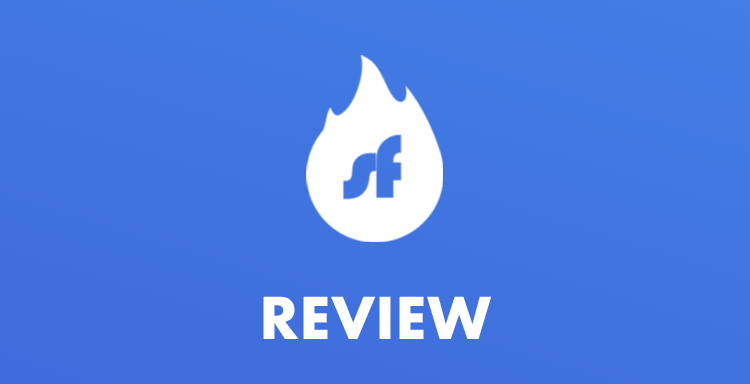 In this short review I will do my best to shine some light on the strengths and weaknesses of the app in an effort to help you decide whether or not Shellfire VPN is the best choice for you. Just a quick note – I tested Shellfire VPN on an iPhone 6s running iOS 10.2. Without further adieu, let’s dive right into it. Before we get into the nitty-gritty, let’s take a quick look at whats going on under the hood. Right off the bat, I want to point out that Shellfire VPN doesn’t keep any logs, which is a huge plus in my books. Additionally, users have three options when it comes to encryption: 128 bit, 192 bit, and 256 bit – these tiers are correlated to your subscription level (more on that later). My favourite thing about this app has to be its ease of use. After downloading it from the App Store and logging in, you won’t need to spend more than 30 seconds setting it up. Regardless of your technical know-how, you’ll be able to get online in just a few taps by following the simple on-screen instructions. Up to this point, I can’t say that my experience with Shellfire has been much different from the dozens of other VPN apps out there. That being said, I quickly noticed a few key differences. For starters, you don’t need to install an individual certificate for each new server – Shellfire seems to handle that on their end, meaning that after the initial set up you won’t need to tinker with much and can get right back to browsing. In fact, aside from picking your server, there isn’t much you can configure – even if you wanted to. While this might be great for less tech-savvy users, those that are more advanced may want to switch between server protocols. Though there isn’t much reason for wanting to do so, the option is nice to have. Unfortunately, with Shellfire you’re stuck with the default. When it comes to server selection, there are quite a few options. As mentioned earlier, Shellfire offers servers in more than 30 countries, which is great for accessing restricted content and bypassing local censorship. Under the “All Servers” tab you have the option to filter servers based on their current load and your membership level. 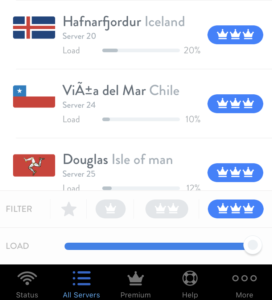 Free users will be limited to just 3 servers – depicted by the single “crown” icon. Paying members are able to sort through the few dozen available locations to either scout for the lowest “load” or to select a specific country. Aside from switching between servers there isn’t much you can do within the app. The bottom bar has a few “options” that will provide more information on the service, but there isn’t anything else that you can configure. The tabs are pretty self explanatory, and unless you’re interested in comparing the different tiers of service, it’s likely that you will never visit any of them more than once. Like most other VPN providers, Shellfire VPN offers a few tiers of service – Free, Premium, and PremiumPlus. As you can see in the screenshots below, the differences are quite extreme. The free membership offers a choice between just 3 servers, with severely limited speeds (1 Mbit/s), whereas the PremiumPlus plan removes all speed caps, and offers the complete selection of Shellfire’s servers. Though the free tier is quite limited, upgrading to either Premium or PremiumPlus won’t break the bank. The Premium subscription will run you just €2.90/month when you chose to pay for the entire year upfront, or €4.00 if you decide to go month to month. If you want to spring for the PremiumPlus plan, expect to pay €5.00/month yearly, or €8.00 on a month to month basis. There are no other hidden fees, and you are free to cancel your subscription at any point. To conclude – Shellfire VPN is a fine, easy to use client. The lack of customization is a bit underwhelming, but there’s no doubt that the app gets the job done. In my opinion, the best thing about Shellfire (aside from its simplicity) is its speed, so if you’re not concerned about the lack of custom options, then it’s certainly not a bad choice. Keep in mind the app is a free download, and if you’re still unsure whether or not Shellfire VPN is the right choice for you, you can test it out for yourself using their free tier. 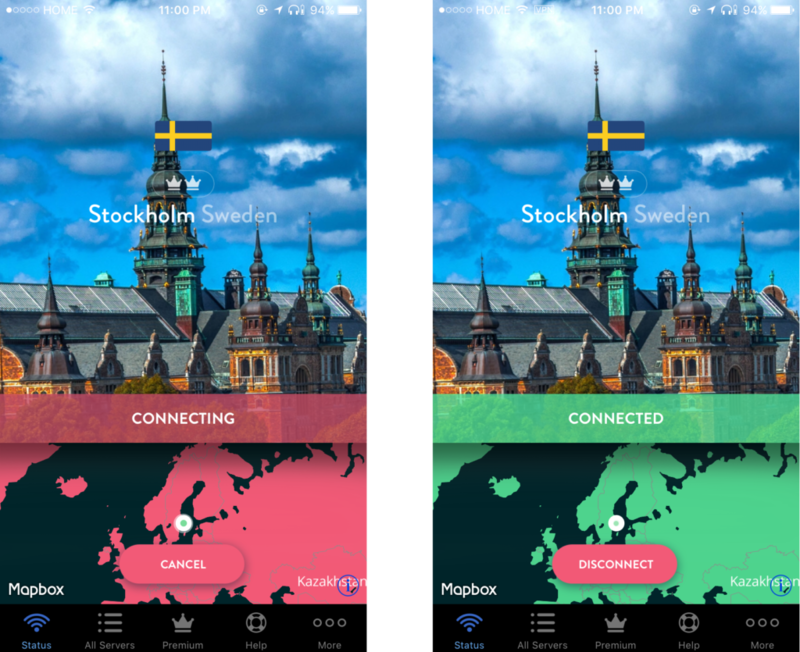 Otherwise, check out our more comprehensive list of VPN providers to find an app that will work for you. TunnelBear Review 2015: Has it got the roar factor?